UPDATED: Tue., Feb. 12, 2019, 9:51 a.m. The 2020 basketball recruits won’t walk into their college classrooms for at least another 18 months and the early signing period isn’t until November, but that doesn’t slow down the top recruits in the country from taking their official visits. Late in Gonzaga’s 94-46 dominating result over Saint Mary’s on Saturday, the Kennel Club started chanting two names: Jalen and Julian. To everyone in the stands and to those who may have heard it on the TV broadcast, those two names wouldn’t have sparked anything more than confusion. But to the two high school juniors on their official recruiting visit, sitting in the front row behind the basket closest to the Zags’ bench, it meant more than any official visit could offer. 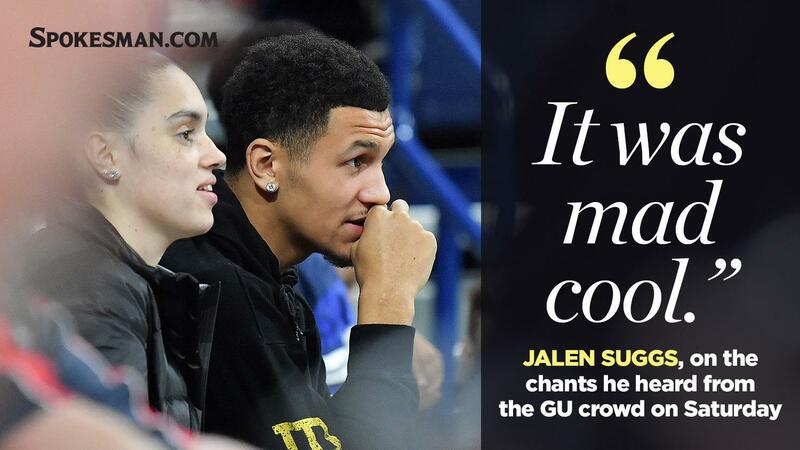 For combo guard Jalen Suggs from Minneapolis, Minnesota, and forward Julian Strawther from Henderson, Nevada, the chants were a special feeling. Suggs is the seventh-ranked prospect and Strawther is No 34. GU’s highest signee was Zach Collins at No. 20 in 2016. Zach Norvell Jr., who was recruited with Collins, knew how unique of an experience it must have been to be recognized like that. Each recruit spent a couple of days in Spokane, getting acclimated with GU’s culture, its facilities and its people. And of course, front-row seats to the Bulldogs’ most important conference game is a nice cherry on top. Assistant coach Donny Daniels has been the link between the recruits and the program and both players felt a strong connection with him as well as the rest of the staff. Both recruits outlined their strengths and what they could offer a powerful program like GU. “Just a lot of versatility and an ability to score at all three levels, play multiple positions, defend and just be a great teammate,” Strawther said. ESPN’s recruiting page had its own takes last month on the two Zag recruits, presenting a strength and a weakness. The official early signing day in November is a while off, but verbal (unofficial) commitments can happen at any time. The Zags already have one verbal commitment for their 2020 class, 6-foot-4 combo guard Dominick Harris from Temecula, California. Harris is ranked as the No. 51 recruit in the country and fifth-best player at his position. As for Suggs and Strawther, GU fans will have to wait and see what they decide, but both players felt welcome and energized during their visit to Spokane. Editor’s note: All rankings are from 24/7 Sports, unless otherwise noted. Published: Feb. 11, 2019, 7:57 p.m. Updated: Feb. 12, 2019, 9:51 a.m.